Monarchs draw crowd in Buenos Aires as they mix with members of the Spanish community in Argentina. Spain's King and Queen played up the importance of bilateral ties and trade opportunities today as they mixed with business leaders from both nations, on their second day of their state visit to Argentina. King Felipe VI and Queen Letizia attended an event this morning at the San Martín Palace in the capital – the headquarters of the Foreign Ministry – that sought to play up the business ties between the two nations. President Mauricio Macri also attended. 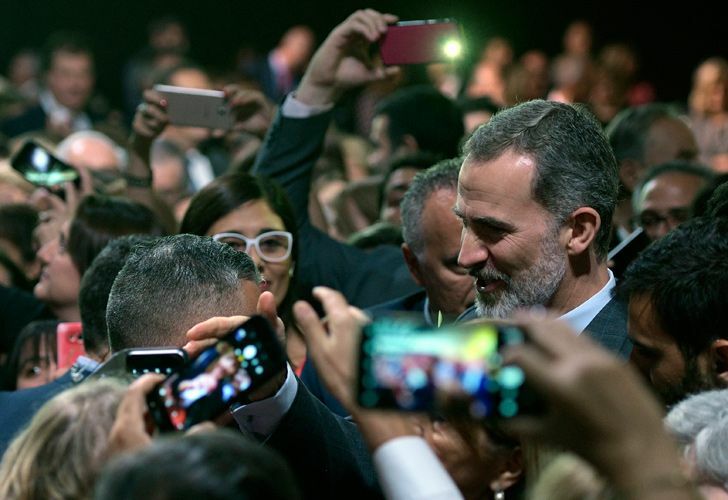 Addressing an audience of officials and business leaders, King Felipe VI declared that "Argentina is of enormous importance for Spain," adding that Spanish firms "maintain an interest and a firm commitment" to invest, despite the economic downturn seen in the host nation. hough Argentina registered a trade surplus of some US$52 million with Spain in 2017, that was the lowest figure seen since 2011. In 2017, exports to Spain were worth US$1.5 billion, which represented a decrease of 7.6 percent compared to 2016. Spanish imports, on the other hand, reached US$1.45 billion – the highest in the 20 years. On Monday, the King had expressed strong support for the Mauricio Macri administration at the Casa Rosada, before attending a gala dinner at the Centro Cultural Kirchner (CCK). "We are very aware of the situation they have gone through in economic terms and we support all the reform programmes that are under way," Felipe said from the Salon Blanco of Government House. Later on Tuesday, the monarchs drew crowds in Buenos Aires as they mixed with members of the Spanish community and met with members of the Ibero-American Jewish Congress. The royal couple are scheduled to travel to Córdoba on Wednesday, where they will inaugurate the eighth Spanish Language Congress.